Since the dawn of the Internet, college librarians have been concerned about the communication of accurate stories racing around the “information superhighway.” Never ones to subscribe to the “if it’s on the Internet, it must be true” idiom, these information professionals have long questioned and looked closely at internet source reliability, authority and bias. 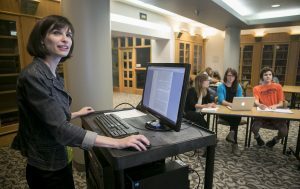 But now that fake news has the spotlight in real news, (i.e., the recent Pizzagate fiasco), one Hope librarian wants students — and all of us, really — to remember that what we search for and read on the internet, especially on social media, is often precisely what we want to search for and read. It’s this “filter bubble” that is causing fake news to find its way in our news feeds in the first place. Jessica Hronchek instructs students in the Van Wylen Library on Hope campus. Fake news thrives when readers refuse to investigate both sides of an issue, or look for other notable news sources, or succumb to emotion rather than reason. Filter bubbles lead us to one-sided debates and harm real research, Hronchek believes. Fake news thrives when readers refuse to investigate both sides of an issue, or look for other notable news sources, or succumb to emotion rather than reason. So, asking critical questions about the bias and authorship of a story should be mandatory for any article online, “because who the source is tells the story as much as the words they use,” Hronchek says. Spreading false news and information can have a measurable, negative impact and it harms real research. The likelihood of an article to trend online is not necessarily connected to its accuracy. If something resonates with you and you share it without taking a moment to do some basic fact-checking, then you may be only spreading false information. Look at the source. Is it credible? Have other outlets written a similar story, or is what you are reading a stand-alone piece? If it’s the only story of its kind on the Internet, it’s probably not a factual story. Fake news capitalizes on emotion. Not real! But a lot of readers on the Internet thought it was. If an article online deeply angers you, ask why. Then double-check your source. 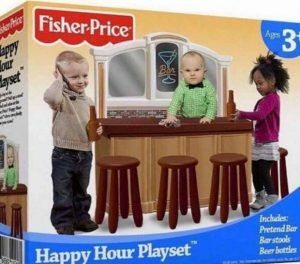 Avoid “click-bait” headlines — those with vague, wild stories that offer up caricatures of issues instead of realistic portrayals (Fisher-Price Happy Hour playset.) And remember, satire stories from The Onion and the New Yorker’s The Borowitz Report are meant to make you click, laugh, and think, while not actually being real news. Slow down. Take time to ask critical questions of yourself and the story you just read. Don’t be tempted to see a story as the only facts you want to see. Instead, look and think more broadly. The world is wide with ideas; don’t narrow your exposure to just one. Now that’s keeping it real.